A bright flash of light appears to be visible in this image taken by the right-side navigation camera on NASA's Mars rover Curiosity on April 3, 2014. New photos snapped by NASA's Curiosity rover have set the Internet abuzz yet again about the possibility of life on Mars. Bright flashes of light appear in two images the 1-ton Curiosity rover captured last week, spurring some UFO buffs to speculate that the Red Planet may host intelligent life that produces and manipulates light as humans do here on Earth. Once seen, it cannot be unseen. The “Mars rat” captured by Curiosity’s lens. This is not the first time that people have seen more in Curiosity's images than is actually there. In September 2012, for example, the rover photographed a landscape that appeared to contain a rodent crouching between two rocks. UFO enthusiasts found the picture, and the "Mars rat" soon went viral. "It's a cute rodent on Mars. Note its lighter-color upper and lower eyelids, its nose and cheek areas, its ear, its front leg and stomach," Scott Waring wrote at UFO Sightings Daily in December 2012. "Looks similar to a squirrel camouflaged in the stones and sand by its colors." Waring and others also claim that a Curiosity image from January 2013 shows an iguana in sufficient detail to make out a nostril, as well as the line of the lizard's mouth. The original 'Face on Mars' image taken by NASA's Viking 1 orbiter, in grey scale, on July, 25 1976. Image shows a remnant massif located in the Cydonia region. And Curiosity isn't the only rover whose surface photos have inspired some flights of fancy. 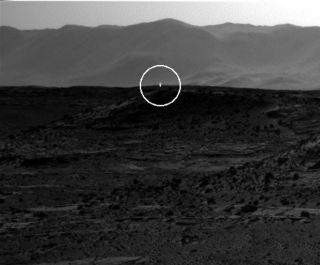 NASA's Spirit rover, for example, captured an image of a Martian "rock person" in 2007. And Spirit's twin, Opportunity, photographed what looked like the head of a rabbit on the Red Planet's surface in 2004. These purported sightings are all examples of pareidolia, experts say. This psychological phenomenon refers to the tendency of the human brain to perceive familiar shapes in vague or random images — spotting a rabbit in a cloud that passes overhead, for example. Pareidolia has long influenced the way people see the Red Planet, going all the way back to astronomer Percival Lowell, who claimed more than a century ago that irrigation canals constructed by an advanced civilization crisscross the Martian surface. Another famous example is the "face on Mars," a feature visible in photos taken of the planet's Cydonia region in 1976 by NASA's Viking 1 orbiter. Some people suggested an ancient Martian civilization constructed the face as a monument, akin to the pyramids of ancient Egypt. But the face is not visible in crisper images of Cydonia taken more recently by other probes, such as NASA's Mars Reconnaissance Orbiter.